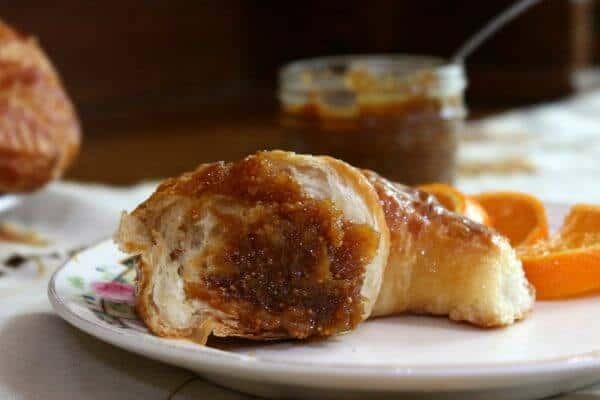 This Homemade Dried Fig Jam with Chipotle is made from dried Black Mission figs so you can make it anytime of the year. Using dried figs enhances the sweetness of the jam giving it more depth and flavor. The chipotle adds a little smoky heat that is absolutely addictive. Best of all, it’s super easy! I have canned, picked, preserved, and made my own jams and jellies for years thanks to a mom and aunts who grew up on a farm, lived through the depression, and carried on the tradition. There have been many, many years where I trotted down to Farmer’s Market for a couple of flats of strawberries and spent an afternoon creating a sticky, but wonderfully perfumed, kitchen. Those days might be over. BUT fig jam, now that’s a totally different story. You can make small batches, as often as you want, in a short period of time, any time you want. At least with this recipe, you can. I prefer to use dried figs. To me, dried figs give fig jam a deeper flavor. It’s sweet and rich with nuances and depths that jam made from fresh figs just doesn’t have. It’s the difference between caramelizing vegetables and just steaming them. I don’t think fresh figs would hold up to the chipotle, either. And, trust me here, spicy smoky chipotle and sweet syrupy dried figs are poetry in flavor form. I’d let it cool and then adjust the chipotle to taste by stirring in a little ground, dried chipotle. Homemade dried fig jam is great on toast or croissants. It’s wonderful spooned over a schmear of chevre on a cracker. It even makes a great ham glaze. If you are having one of those days you can eat it off the spoon, I won’t tell. I understand. I use the little four ounce quilted jam jars. They work great and fig jam makes wonderful gifts! Sweet, smoky, and a little spicy this fig jam goes with everything from croissants to ham! It's so easy to make and you can make it anytime since it uses dried figs. 1/8 teaspoon of chipotle powder if needed after jam cools. Chop the figs finely in a food processor. Mix the the water, honey, chipotle, and lemon juice in a saucepan. Add the chopped figs and bring to a simmer. Simmer for about 5 to 10 minutes, or until it is as thick as you like. Taste and cautiously add chipotle as desired. I love this idea since I no longer have access to fresh figs. I was wondering if you had any ideas to can/process this jam ? Cindy, it’s so quick to make I don’t can it. It will keep for a couple of weeks in the fridge..I imagine you could also freeze it. Sorry I can’t be more help with that. What a wonderful way to use figs. I love fig jam and this tastes so delicious. Love the sound of this. I imagine it would be a nice accompaniment to cheeses too. Delish! I love the heat the chipotle will bring to this sweet fig. I’d love it on toast with a slice of white cheddar…extra sharp. YUM that is perfect Michelle! 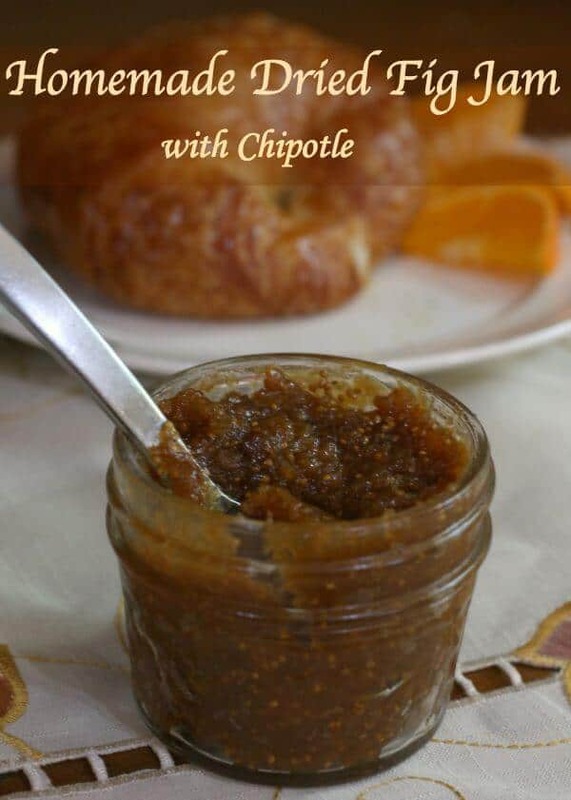 We’ve never made fig jam, this sounds delicious, I like the added kick from the chipotle and those little mason jars are so cute, perfect for gift giving! I have sampled some fig jams, but never made my own – and I am LOVING your version with chipotles! What a lovely tradition to have carried on for so many years – and it shows in your jam making skills even though you haven’t done it in awhile! Thank you! It is delicious with the heat from the chipotle!